Nicole's Needlework: We're in Florida! It's been a crazy few days, but we're here, and slowly getting settled. It turns out Matthew developed a staph infection. When he was seven days old I noticed a little blister on his tummy. I was taking him to the doctor anyway, so I had him check it out. Well, right away he believed it to be staph. They did some tests and sure enough he had a MRSA - a type of staph infection. The doctor had prescribed some antibiotics before we left and before we knew exactly what it was. He called on my cell phone to tell me what he had and asked me to call. I called yesterday and the nurse said I need him to be seen by someone that day. Unfortunately school is getting ready to start and the pediatricians were booked. A pediatrician I talked to recommended that we take him to the children's hospital. We did and four hours later they said don't do anything, but watch him for fever or change in behavior. They took him off the antibiotic and told us to just give him a bath every other day. They said it's superficial - meaning it just on the skin and not deeper. He hasn't been acting out of the ordinary. No fever, no fussiness, and has been eating fine. So I'm trying not to stress or worry, it's just hard when he's so tiny! He's been sleeping longer at night, which is very nice! 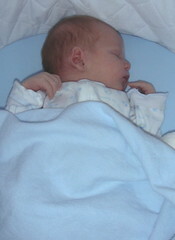 Matthew - 12 days old. Welcome to Florida! I wonder are you near to me? Glad things are going well. Baby looks great! Glad your move went safely. Hope all will be cleared up with Matthew soon! He is adorable. You are doing so well with everything you've got going on! Glad that the move went well and that Matthew will be fine despite his little infection. Take care! Glad the move went well too. Hope Matthew feels better soon. Nicole, Matthew is just beautiful. You are an amazing woman to have handled a move with such a young baby! I have "Pear" too and have seen lots of finishes on my Little House Needleworks group -- looks like a fun stitch that turns out nicely. Glad your move went smoothly! Hope Mathew gets rid of that infection! When does Bradley start school?